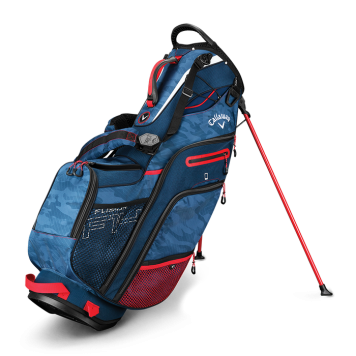 The Fusion 14 fuses the best of storage and a 14-way top of a cart bag in a light weight stand bag. It features 12 well thought out pockets, including a magnetic valuables and water bottle pocket, a quick access cell phone sleeve and quick release straps so you can remove them and keep them out of the way when on a cart or trolley. The mesh covered audio pocket is a perfect way to take your tunes to the course. Our new X-Act Fit strap system will self-balance the bag on your shoulders for a better carry experience.